In the old days lives were saved by Zippo lighters. “My wife’s uncle works in a military hospital and told me about this. Its pretty amazing. Kevin Garrad (3rd Infantry Division) was on a street patrol in Iraq (Tikrit I believe) and as he rounded the corner of a building an armed (AK-47) insurgent came from the other side. I am not making this up. Watch the video. 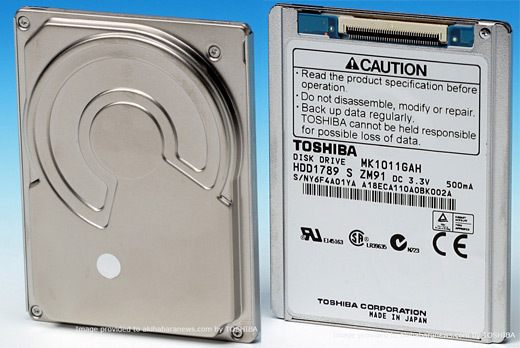 Toshiba has announced the availabibiltiy ofa a 1.8 inch, 100 gb hard drive. Fits the iPod chassis and would be perfect for the rumored iPhone. Best question: “Who’s going to buy this? My own moment of wonder: Why did MS include wifi that won’t allow you upload music from PC to Zune without wires?! Punchline: the last 15 seconds of the clip turn into an endorsement for the Shuffle- did Apple pay for this?! This enterprising soul shares his success in building a solar charger for an iPod. He risks exploding batteries and his iPod in the search for success. Remember, this might kill your iPod. Or you might build a successful charger. Click here and good luck. Couldn’t you make this yourself with an empty Altiods tin? iPod enable Levis..headphones..secret pocket…more expensive than the gadget itself. Read more at Cnet. Finally…could the rumors be true (again)? The iPod touch screen rumors are flying once again. This time there may be photographic proof to back it up. While many have accepted the restrictive DRM of the iTunes/iPod family, Norway is the second European country to take issue with Apple's insular copyright protection. As a result, Apple may be banned from the Norweigian market. Sure, the numbers aren't big BUT what if this started a trends towards official anti-iTunes policies across the continent? Read more at arstechnica.